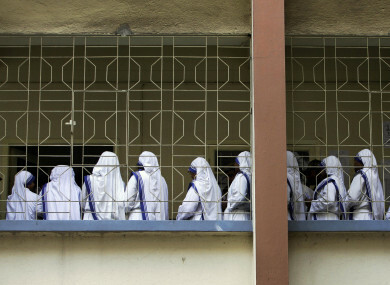 Nuns of Missionaries of Charity, the order founded by Mother Teresa, stand in a queue to cast their vote in Kolkata, India (April 2011). A NUN AND a staff member at Mother Teresa’s Missionaries of Charity in eastern India were arrested today for allegedly selling babies born to unwed mothers, police said. The pair were arrested from the grounds of one of the offices of the charity in Jharkhand on charges of child trafficking, police in the state capital Ranchi said. The women could face up to five years in prison for selling a baby boy from the institution founded by the Nobel laureate, which cares for unwed pregnant women and mothers in distress. Police said the infant was sold to a family in neighbouring Uttar Pradesh state for $1,700 by the two suspects. They could face more charges as investigations widen into the illegal adoption scam, said Ranchi senior superintendent Aneesh Gupta. “The women have admitted to four more such cases which we are in the process of verifying. The families which bought the babies are also under our radar and will face action,” he told AFP. Authorities grew suspicious after the state’s Child Welfare Committee discovered a newborn boy was missing from the centre last week. Nuns at the charity told police that the boy’s mother had taken the child away, said Ranchi inspector general Ashish Batra. “However, on being contacted, the mother said that she did not have the baby with her,” Batra said. The hospitals where the children were delivered will also be investigated, police said. Mother Teresa was a missionary nun who became a global symbol of compassion but she was also a controversial and divisive figure. She remained fervently opposed to birth control and abortion, describing the latter as “direct murder by the mother herself” in her Nobel acceptance speech. Mother Teresa, who was 87 when she died in 1997, was buried in Kolkata in eastern India, where Missionaries of Charity is headquartered. Email “Mother Teresa charity 'sold babies' born to unwed mothers”. Feedback on “Mother Teresa charity 'sold babies' born to unwed mothers”.